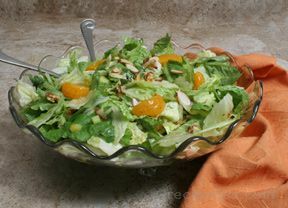 This salad has all the right ingredients, from crisp lettuce, to salty bacon, to crunchy almonds, with an light dressing. Dress it right before you are ready to serve to keep the textures. In a jar with a tight fitting lid, combine oil, sugar, vinegar, salt and pepper. Shake well. Chill for 1 hour. 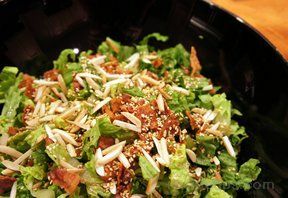 Just before serving combine lettuce, bacon with toasted almonds and sesame seeds in a large bowl. 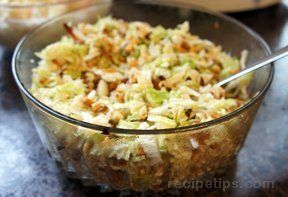 Add dressing and toss. Top with chow mein noodles, if desired. 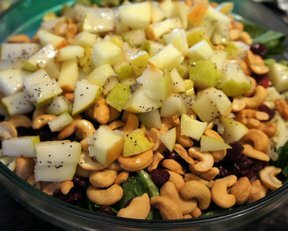 "Made this salad in a pinch to bring over to my neighbors on a last minute patio party. Everyone loved it. I used Romaine lettuce."